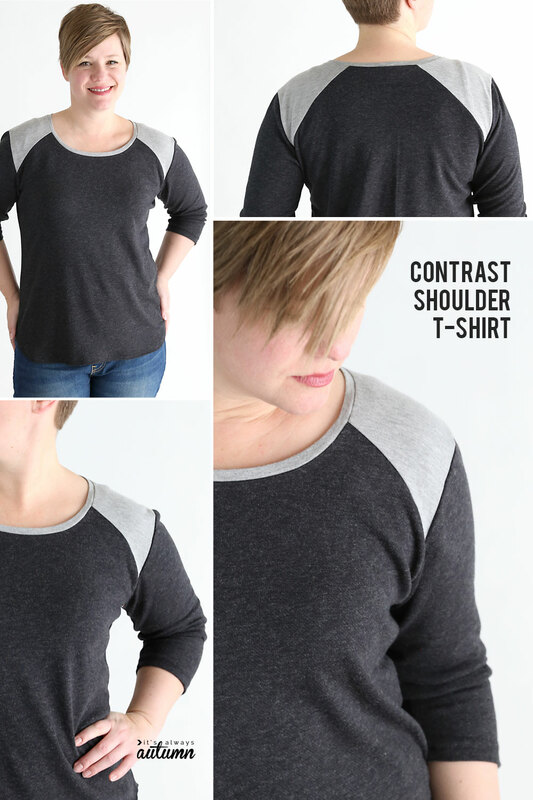 In today’s post: Learn how to hack my Classic Tee pattern to add a contrast shoulder. And today I have yet another variation for you! I’m calling this the Contrast Shoulder Top. 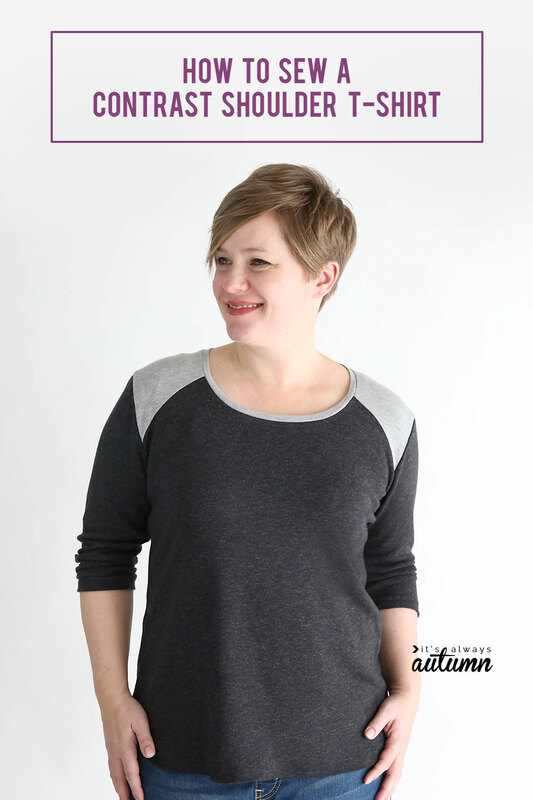 To make this top, you’ll need to visit the Classic Tee post and download the free printable pattern. Follow the instructions in that post for printing and taping together the pattern, and for prewashing your knit fabric. For this variation, we are going to add a contrasting panel that goes across the shoulders of the shirt. So you will want a main fabric (for most of the shirt piece and the sleeve pieces) and a small amount of a contrast fabric (for the contrast shoulder panels). 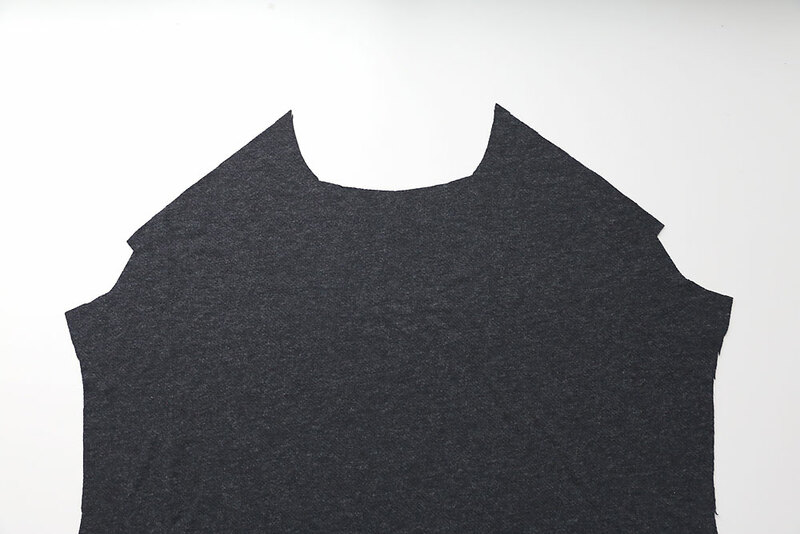 We’ll begin by slicing up the shirt pattern as shown below (sleeve pattern does not get changed). First, cut a diagonal line from the neck to the armscye as you can see in the photo below. 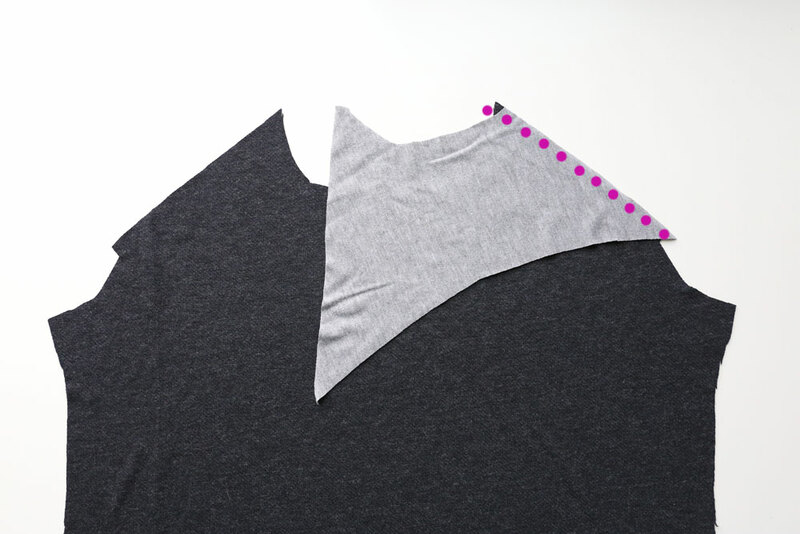 Second, cut off 1/2 an inch at the shoulder seam, as shown by the purple dotted line. Now you can cut out the larger pattern pieces from your main fabric, and the smaller angled shoulder pieces from a contrast fabric. BE SURE to add 1/2 inch seam allowance along the line where the shirt pattern was sliced on both the shirt pieces and the contrast pieces. Also, you will cut the smaller contrast piece ON THE FOLD, which is why we cut half an inch off the pattern at that spot. Now you will have two shirt pieces and two contrast pieces. 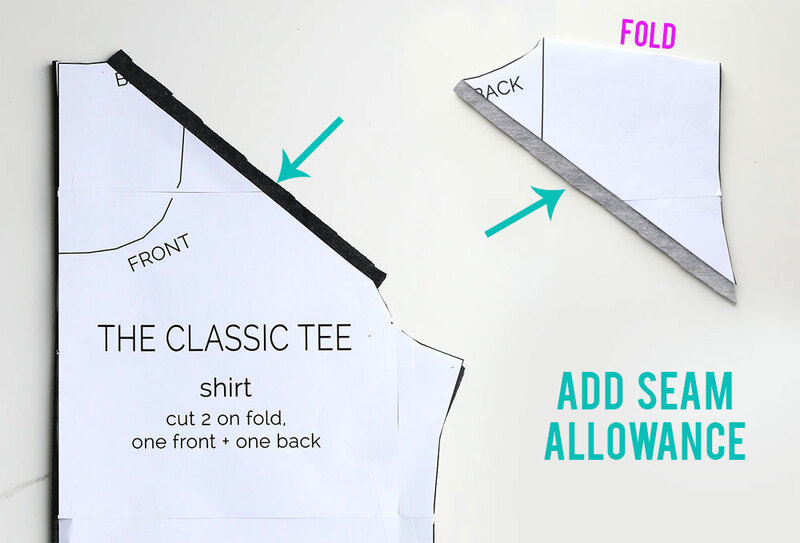 Be sure one shirt piece is cut using the front neckline and the other is cut using the back neckline. The contrast pieces need to use both the front and back necklines as well. Open up the contrast pieces, and they will look like the photo on the left below (only using the back neckline). 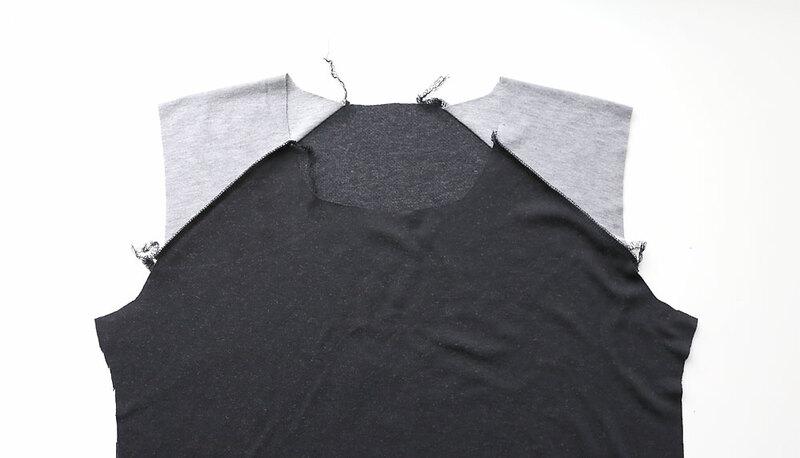 Cut along one side of each contrast piece using the front neckline so they look like the photo on the right. Time for assembly! Start by laying the front shirt piece down on a flat surface, with the right side facing up. Then lay a contrast piece on top of it, matching the areas where you cut the pattern apart and added seam allowance. Be sure right sides match, and be sure you are matching up the part of the contrast piece that was cut using the front neckline. Sew together using a 1/2 inch seam allowance. Repeat with the contrast piece on the other side, and then press the seams open. 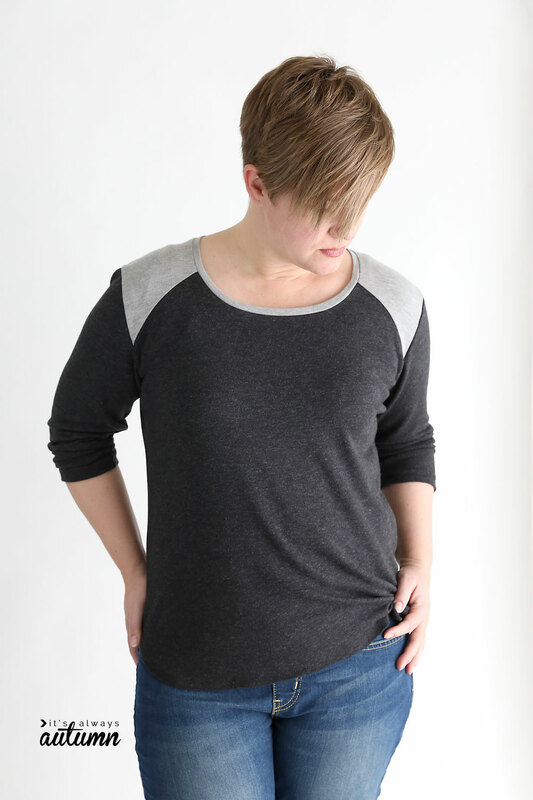 At this point, the rest of construction continues in the exact same way as is described in the Classic Tee post (pick up right after you sew the shoulder seams together). 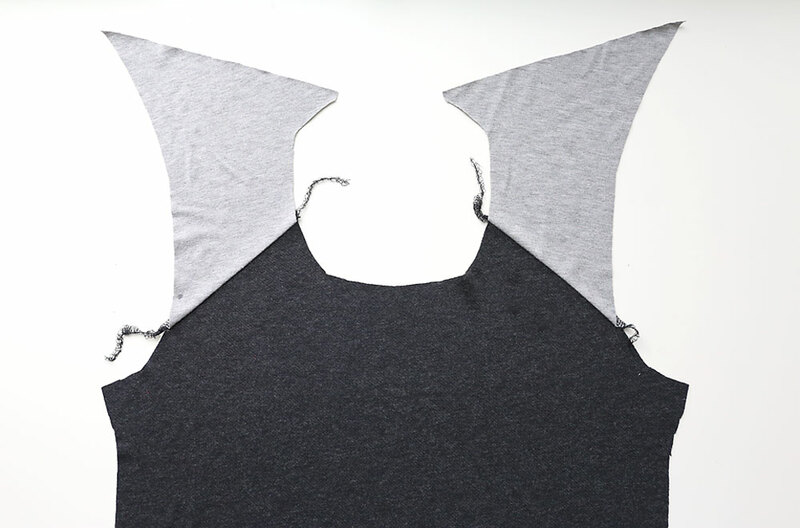 It’s an easy modification that gives a lot of interest to a plain t-shirt. Thanks for reading, and I’d love to see photos if you end up using this pattern! Thanks for the add on. I love your patterns and use them all the time. This will be a great addition.